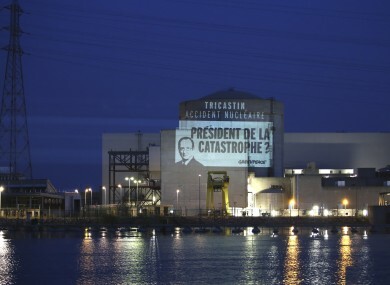 Activists hung banners reading “Tricastin: a nuclear accident” and “Francois Hollande: president of a catastrophe?”. A projection by activists at the plant today. POLICE IN FRANCE today arrested 29 Greenpeace activists who snuck into a nuclear plant in the south of the country, in the latest break-in by the environmental group aimed at highlighting alleged security weaknesses at atomic facilities. They hung yellow banners reading “Tricastin: a nuclear accident” and “Francois Hollande: president of a catastrophe?” in reference to the French president, according to Isabelle Philippe, a spokeswoman for the environmental group. “It was the easiest thing in the world for the activists to enter the plant, it took them 20 minutes to get from the entrance to the top of the structures,” she said. The interior ministry said all the activists had been detained in a full sweep of the facility. It took several hours to arrest them all, after some had chained themselves to structures inside the plant. Among those arrested were French, Italian, Romanian, Spanish, Russian, Portuguese, Swiss, German and Belgian nationals. The government said in a statement that it was considering “stiffer penalties” for such actions, which can currently only be prosecuted as trespassing offences. “The judicial framework must be able to better meet security needs,” it said. Hollande said he had confidence in the country’s nuclear security agency. “It has given us every guarantee that nuclear security is respected absolutely,” he said. The activists “were not able to access the plant’s sensitive areas,” like command rooms, interior ministry spokesman Pierre-Henry Brandet said. “It’s a media stunt that poses no security danger,” he said. He insisted that the environmentalists, who divided into three groups upon entering the plant, “were immediately detected”. The EDF energy giant that runs France’s atomic power plants also said that the activists did not manage to reach any sensitive areas within the site. France’s interior and energy ministers called for an investigation. The head of the Green party faction in France’s Senate, Jean-Vincent Place, hailed Greenpeace’s “civil action” for “alerting the French” to the potential dangers of nuclear power. But others criticised the move. Greenpeace has staged several break-ins at French nuclear plants in recent years in an effort to highlight what they say are dangers of atomic power and to expose security problems at the power stations. In May 2012, an activist with the group flew into the grounds of the Bugey plant in southeastern France using a hang glider, in a stunt aimed at revealing alleged security flaws. He flew over the plant, threw a smoke bomb and landed inside before being arrested. France is heavily reliant on nuclear power, with its 58 nuclear reactors producing some 75 percent of the nation’s electricity. The Tricastin plant went online in 1980 and last year produced 24 billion kilowatt hours of electricity, which is the equivalent of consumption of around 3.5 million people, according to EDF. Concerns were raised over the safety of the plant last August, when Belgium’s AFCN nuclear control agency said there were “indications” of “dangerous” cracks in one of its tanks. French authorities said there were “defects” in its outer layer but that they were not dangerous and were regularly checked. Email “Greenpeace activists arrested in France after nuclear plant break-in”. Feedback on “Greenpeace activists arrested in France after nuclear plant break-in”.